Rosie the Riveter was a fictional character featured in a propaganda campaign created by the U.S. government to encourage white middle-class women to work outside the home during World War II. Although frequently associated with the contemporary women's movement, Rosie the Riveter was not supposed to promote change or enhance the role of women in society and the workplace in the 1940s. Instead, she was meant to represent the ideal female worker and help fill the temporary industrial labor shortage caused by the combination of fewer male workers (due to the draft and/or enlistment) and increased production of military equipment and supplies. According to Emily Yellin, author of Our Mothers' War: American Women at Home and at the Front During World War II (Simon & Shuster 2004), Rosie the Riveter first appeared in 1943 in a song by a male singing group called The Four Vagabonds. Rosie the Riveter was described as putting other girls to shame because "All day long whether rain or shine/She's part of the assembly line/She's making history working for victory" so that her boyfriend Charlie, fighting overseas, can someday come home and marry her. The song was soon followed by a rendering of Rosie by noted illustrator Norman Rockwell on the May 29, 1943 cover of The Saturday Evening Post. This brawny and unglamorous portrayal was later followed by a more glamorous and colorful depiction with Rosie wearing a red bandanna, decidedly feminine features and the phrase "We Can Do It!" in a speech balloon above her trim figure. It is this version, commissioned by the U.S. War Production Coordinating Committee and created by artist J. Howard Miller, that has become the iconic image associated with the phrase "Rosie the Riveter." Each theme had its own rationale as to why women should work during wartime. The war would end sooner if more women worked. More soldiers would die if women didn't work. Able-bodied women who didn't work were seen as slackers. Women who avoided work were equated with men who avoided the draft. Although the government saw merit in luring unskilled women (with no work experience) with the promise of a fat paycheck, the approach was regarded as a double-edged sword. There was a real fear that once these women started earning a weekly paycheck, they would overspend and cause inflation. To overcome the stigmas associated with physical labor, the campaign portrayed women workers as glamorous. Working was the fashionable thing to do, and the implication was that women need not worry about their appearance as they would still be seen as feminine underneath the sweat and grime. To address the fears of women who perceived factory work as dangerous and difficult, the government propaganda campaign compared housework to factory work, suggesting that most women already possessed the necessary skills to get hired. Although war work was described as easy enough for women, there was concern that if the work were seen as too easy, women might not take their jobs seriously. Since it was widely believed that a woman would not consider working if her husband objected to the idea, the government propaganda campaign also addressed the concerns of men. It emphasized that a wife who worked did not reflect poorly on her husband and did not indicate he was unable to adequately provide for his family. Instead, men whose wives worked were told they should feel the same sense of pride as those whose sons enlisted. Oddly enough, Rosie the Riveter has emerged as a cultural icon, gaining greater significance over the years and evolving far beyond her original purpose as a recruitment aid to attract temporary female workers during wartime. Although later adopted by women's groups and proudly embraced as a symbol of strong independent women, the Rosie the Riveter image was never intended to empower women. Her creators never meant for her to be anything other than a temporarily displaced homemaker whose only purpose was to support the war effort. It was largely understood that Rosie worked solely to "bring the boys home" and would eventually be replaced when they returned from overseas, and it was a given that she'd resume her domestic role as housewife and mother without complaint or regret. And that's exactly what happened for the vast majority of women who worked to fill a wartime need and then, once the war was over, were no longer needed or even wanted in the workplace. 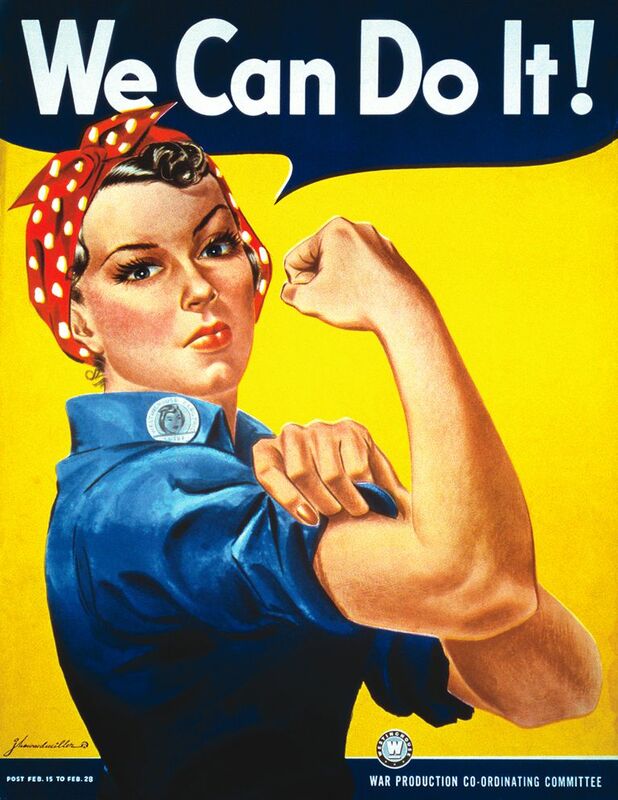 It would take another generation or two for Rosie's "We Can Do It!" sense of determination to emerge and empower women workers of all ages, backgrounds, and economic levels. Yet for the brief time she captured the imaginations of white middle-class women who yearned to follow in the footsteps of this heroic, patriotic, and glamorous female figure doing a man's job, she paved the way for gender equity and greater gains for women throughout our society in the decades ahead.